The New York Times bestseller by poet Nina Riggs, mother of two young sons and the direct descendant of Ralph Waldo Emerson, is “a stunning…heart-rending meditation on life…It is this year’s When Breath Becomes Air” (The Washington Post). We are breathless but we love the days. They are promises. They are the only way to walk from one night to the other. Poet and essayist Nina Riggs was just thirty-seven years old when initially diagnosed with breast cancer—one small spot. Within a year, she received the devastating news that her cancer was terminal. How does a dying person learn to live each day “unattached to outcome”? How does one approach the moments, big and small, with both love and honesty? How does a young mother and wife prepare her two young children and adored husband for a loss that will shape the rest of their lives? How do we want to be remembered? Exploring motherhood, marriage, friendship, and memory, Nina asks: What makes a meaningful life when one has limited time? 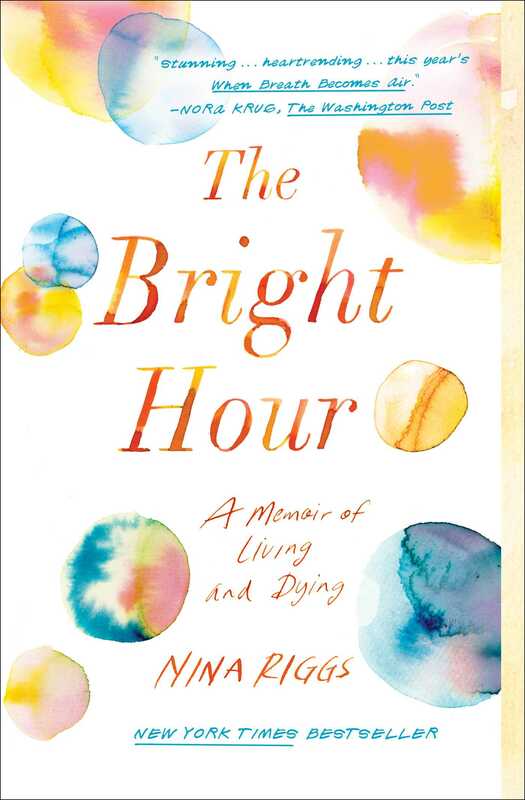 “Profound and poignant” (O, The Oprah Magazine), The Bright Hour is about how to make the most of all the days, even the painful ones. It’s about the way literature, especially Nina’s direct ancestor, Ralph Waldo Emerson, and her other muse, Montaigne, can be a balm and a form of prayer. Brilliantly written and exceptionally moving, it’s a “deeply affecting memoir, a simultaneously heartbreaking and funny account of living with loss and the specter of death. As Riggs lyrically, unflinchingly details her reality, she finds beauty and truth that comfort even amid the crushing sadness” (People, Book of the Week). Tender and heartwarming, The Bright Hour “is a gentle reminder to cherish each day” (Entertainment Weekly, Best New Books) and offers us this important perspective: “You can read a multitude books about how to die, but Riggs, a dying woman, will show you how to live” (The New York Times Book Review, Editor’s Choice). The call comes when John is away at a conference in New Orleans. Let’s not linger on the thin light sifting into our bedroom as I fold laundry, the last leaves shivering on the willow oak outside—preparing to let go but not yet letting go. The heat chattering in the vent. The dog working a spot on her leg. The new year hanging in the air like a question mark. The phone buzzing on the bed. It’s almost noon. Out at the school, the kids must be lining up for recess, their fingers tunneling into their gloves like explorers. I repeat it to my dad who shows up at my house with chicken soup. I repeat it to my best friend, Tita, and she repeats it to me as we sit on the couch obsessing over all twenty words of the phone conversation with the doctor. I repeat it brushing my teeth, in the carpool line, unclasping my bra, falling asleep, walking the aisles of the grocery store, walking on the greenway, lying in the cramped, clanky cave of the MRI machine while they take a closer look. One small spot. It becomes a chant, a rallying cry. One small spot is fixable. One small spot is a year of your life. No one dies from one small spot. This reading group guide for The Bright Hour includes an introduction, discussion questions, and ideas for enhancing your book club. The suggested questions are intended to help your reading group find new and interesting angles and topics for your discussion. We hope that these ideas will enrich your conversation and increase your enjoyment of the book. 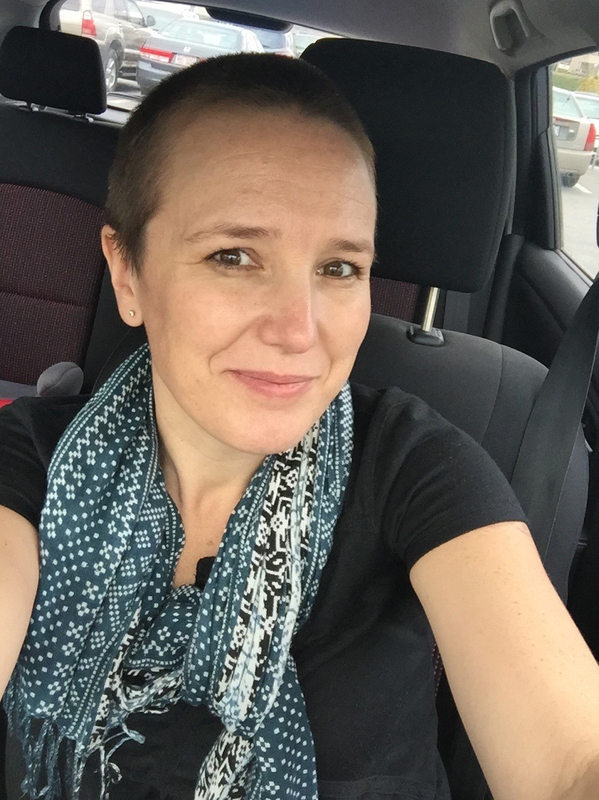 Nina Riggs, a poet, mother of two young boys, and a wife of sixteen years, was just thirty-seven years old when diagnosed with treatable breast cancer—“one small spot.” Within a year, her cancer was terminal. Exploring motherhood, marriage, friendship, and memory, even as she wrestles with the legacy of her great-great-great grandfather Ralph Waldo Emerson, Nina Riggs’s breathtaking memoir asks: What makes a meaningful life when one has limited time? 1. Discuss the book’s epigraph. Nina has included quotes from Ralph Waldo Emerson throughout The Bright Hour. Why do you think she chose this passage as the epigraph? How does it frame your reading of The Bright Hour? Do you think that growing up as a descendant of Emerson affected Nina’s worldview? If so, in what ways? 2. When Freddy is back home from the hospital, he tells Nina, “Sometimes I miss the hospital so much I could cry” (p. 28). Why do you think Freddy misses being in the hospital? How was it a place of comfort to him? Both Nina and Freddy remember his hospital stay very differently. Describe how each of them experienced it. 3. One of the members of Nina’s book club says, “The beautiful, heavy [books] have a way of shutting us all up” (p. 60). Why might the “heavy” books stop conversation? Is this true of your book club? Discuss your past selections. Which books led to your best conversations? 4. Nina and her mother both employ gallows humor throughout their illnesses. Can you think of some examples from The Bright Hour? Were there any that you found particularly funny? If so, what were they? What’s the effect of gallows humor on others within their orbit? How do you think that it allows the women to cope? 5. What is the effect of having this book broken up into sections designated as stages? Does it help you better understand the progression of Nina’s cancer? If so, how? Did you like the chapter headings? Explain your answer. 6. How does Nina react when John tells her that he cannot wait for things to return to normal? Why is Nina surprised by her reaction? Were you? Why or why not? What do you think Nina means when she tells John that she has to “love these days in the same way I love any other” (p. 73). Explain the rationale behind Nina’s assertion. 7. Describe the effect that going shopping for a breast prosthesis has on Nina. What prompts her to seek out the experience? Were you surprised to learn from Nina that “sometimes I prefer the one-sidedness” (p. 180). Why does she feel this way? 8. After consulting her oncologist, who is a mother of a small boy, Nina takes her sons to see the hospital’s linear accelerator. Why does Nina want her children to see the machine? Describe their visit. How does seeing the machine affect them? What effect does seeing the machine through her sons’ eyes have on Nina? Do you agree with the doctor that it’s a good idea for Nina’s boys to see it? Why or why not? 10. Nina quotes Montaigne (“We have to learn that what cannot be cured must be endured”), saying, “You see why I talk to him all day” (p. 122). Discuss the use of Montaigne’s writings throughout The Bright Hour. How does reading Montaigne help Nina? Did you find any of the passages she quotes particularly moving? Which ones and why? 11. Were you surprised by Nina’s decision spend a few days at Well of Mercy after she’s received a terminal diagnosis? What motivates Nina to go to the retreat? How did doing so help her mother? Discuss Nina’s experience there. How, if at all, does this help Nina come to terms with her illness? 12. Nina writes that “Cancer removes whatever weird barriers we sometimes have with others” (p. 37). Do you agree? If so, what is it about a cancer diagnosis that leads to this? Can you think of some examples of this happening in The Bright Hour? 13. One of Nina’s doctors tells her that she should “Listen to what [Nurse Jon] has to say. What he has to offer you is way more valuable than anything I have” (p. 204). Discuss the effect this nurse has on the hospital staff and on Nina. What does he teach them? Do you agree with the doctor’s statement? If so, why? 14. While Nina is back in the emergency room toward the end of her illness, the attending physician tells her, “It’s probably time to put your affairs in order and make a bucket list, as hard as that is to hear” (p. 209). Explain Nina’s reaction. Why is putting together a bucket list something that stumps Nina? What did you think of John’s suggestion? What would you include on a bucket list? 1. John describes having Nina’s essay, “When a Couch is More than a Couch,” published in the New York Times as “a dream publication and one that led directly to this book” (p. 309). Read that essay at https://www.nytimes.com/2016/09/25/fashion/modern-love-when-a-couch-is-more-than-a-couch.html and discuss it with your book club. How did Nina elaborate on the themes in this essay in The Bright Hour? 2. While Nina is in college, she works at a camp for gifted kids, teaching them creative writing. She recounts taking her class to a nearby graveyard and giving them prompts, including “Write the first paragraph of a love story that begins in [a] cemetery” (p. 35). Try this exercise with your book club and share your opening paragraphs. Are there any stories you’re interested in hearing more of? 3. When Nina’s son notices that she’s binge-watching Chasing Life, he says “So, you’re watching a cancer show. Why would you do that?” (p. 91). Watch Chasing Life or another “cancer show” with your book club. Why might Nina or other people battling cancer watch these shows? Are there any television shows or movies that deal with the subject of cancer that you find particularly cathartic? Which ones and why? 4. Nina writes that her children think she’s obsessed with the word please. In response, she makes “them a list one night. A list they won’t possibly understand for twenty to thirty years, but I am trying to write things down” (p. 75). Discuss Nina’s list. Do you agree with Nina’s reasons? Come up with your own extension of Nina’s list and share it with your book club. 5. Many reviewers have compared The Bright Hour to the 2015 posthumous memoir When Breath Becomes Air by neurosurgeon Paul Kalanithi. Have your book club read When Breath Becomes Air and discuss how the perspective of a physician versus a poet changes the message in the memoirs. What common themes come up in both books? Nina Riggs received her MFA in poetry in 2004 and published a book of poems, Lucky, Lucky, in 2009. She wrote about life with metastatic breast cancer on her blog, Suspicious Country; her recent work has appeared in The Washington Post and The New York Times. She lived with her husband and sons and dogs in Greensboro, North Carolina. She is the author of The Bright Hour. "The Bright Hour is a stunning work, a heart-rending meditation on life—not just how to appreciate it while you’re living it, but how to embrace its end, too. It is this year’s When Breath Becomes Air." "Beautiful and haunting...a thoughtful and heartbreaking exploration of what makes life meaningful in a person's remaining days...Buried within this agonizing tale are moments of levity — I laughed out loud many, many times — and flashes of poetry...This book provides a stunning look at that experience and has forever changed my understanding of the illness narrative. It’s a book every doctor and patient should read…It's hard not to compare The Bright Hour to When Breath Becomes Air, Paul Kalanithi's best-selling memoir about his battle with lung cancer. Both were in their late 30s when they discovered they were dying, and both write spare prose with a poignancy that is uncommon. However, Riggs' book is markedly different in tone and content. It's more humorous and less philosophical — but equally moving." "Poet Nina Riggs was only 37, the mother of two young sons, when she was diagnosed with breast cancer. Within a year she had lost her mother to multiple myeloma—and learned her own cancer was terminal as well. Riggs died last February, leaving behind this deeply affecting memoir, a simultaneously heartbreaking and funny account of living with loss and the specter of death. As she lyrically, unflinchingly details her reality, she finds beauty and truth that comfort even amid the crushing sadness." "Profound and poignant...superb...I put down The Bright Hour a slightly different, and better, person - unbearably sad and also feeling, as Riggs did, 'the hug of the world.'" "A vivid, immediate dispatch from the front lines of mortality and a record of a life by someone who wasn't done living yet. But there is nothing maudlin about it...her warm portraits of each of [the members of her closest circle] are a large part of the book's emotional power. So is something we don't notice fully until it's gone: the strength and clarity of Riggs's voice, which never faded on the page, and which we won't get to hear again." "Fans of Paul Kalanithi's heart-wrenching memoir will enjoy this poignant story about how a grown woman—who's also a direct descendant of Ralph Waldo Emerson—spends her last days after being diagnosed with terminal breast cancer." "A luminous, heartbreaking symphony of wit, wisdom, pain, parenting, and perseverance against insurmountable odds." "Riggs reminds us that we are all in this world until we leave it; the gallows humor surrounding her mother's funeral will make readers howl guiltily but appreciatively. Whether confronting disease or not, everyone should read this beautifully crafted book as it imbues life and loved ones with a particularly transcendent glow." "Author Nina Riggs was 37, the mother of two young sons, and married to her best friend when she was diagnosed with terminal breast cancer. This is the story of how she faced the unthinkable with humanity and most of all with love." “Through this warmhearted memoir, Riggs writes her way to accepting her own death and the uncertainty that follows it. The Bright Hour is an introspective, well-considered tribute to life. As Riggs’ famed ancestor Emerson writes, 'That is morning; to cease for a bright hour to be a prisoner of this sickly body and to become as large as the World.'" "A beautiful gift...A heartrending reminder of life’s worthiness from the descendent of Ralph Waldo Emerson, this is a beautiful time-capsule of Riggs’ experiences." "Poignant...For anyone looking for wise words on the subject of cancer—this is your book, but it also contains so much more. Riggs was the great-great-great-granddaughter of Ralph Waldo Emerson, and there is a running theme throughout the book about the huge importance of art and the humanity it can impart." "It’s a tearjerker, but if you enjoyed When Breath Becomes Air, this book will hit the same emotional spots." "With The Bright Hour, Riggs leaves behind a literary legacy that captures both her incredible talent and her unwavering love for her family...Her lyrical, honest prose immerses the reader in her world — you feel the fear, the despair, the joy...Riggs perfectly captures the strange, sometimes otherworldly feeling experience of cancer treatment...But though one might expect a tome of sadness and despair from a writer with only months left to live, Riggs fills her memoir with vivid, messy, beautiful life. The book illustrates how Riggs’ sense of humor never falters...Riggs seamlessly integrates both Emerson’s and Montaigne’s thoughts on life, death and health, adding a richness to her own experience." "How a woman can have this much emotional clarity and narrative power while fighting for her life should astonish every last one of us. Magical. Unforgettable." “Nina Riggs could have written a memoir about dying. Instead, she has given us a book exploding with life. Every page of The Bright Hour (“bright” the operative word here) is filled with the mysterious, messy, funny, heartbreaking stuff that only happens in the most loving of families. Clearly, hers is one. “Writing with frank and exquisite honesty and a striking absence of sentimentality or self-pity in the final days of a terminal struggle, she explores everything from her children’s choice of Halloween costumes and her own, of a new sofa, to the essays of Ralph Waldo Emerson and Montaigne. Though no doubt challenged by constant physical depletion and grief—a fact of her illness she chooses not to dwell on—Riggs emerges as a character whose ultimate victory will not take the form of beating cancer, but of refusing to allow cancer to destroy her life-embracing spirit. As she allows us into her world of wig shopping and heart to heart conversations with her boys, it becomes impossible not to love this woman (also her quirky, tenderly rendered sons, and her quietly suffering husband, whose future remarriage she allows herself to envision). "Nina Riggs writes gorgeously and with astonishing clarity about her own terminal illness, about losing her mother, about her marriage and her children, about books that have guided her, and also about the often comical challenges of daily life as a busy parent. Riggs never shies away from describing the terrible sadness and messiness of her own dying, but also manages to suffuse this book with a miraculous blend of light and joy. This is an emotional journey told with raw honesty and also a sly sense of humor. "The Bright Hour is an instant classic that deserves to be read by everyone who loved When Breath Becomes Air by Paul Kalanithi and Being Mortal by Atul Guwande. Like those, here is a book about dying that has powerful lessons for everyone about how to live."